St. Augustine, FL – Occasions Media Group, publishers of St. Augustine Social magazine, have acquired Old City Life magazine and merged the two brands together to create one big, impactful city magazine of St. Augustine, FL. The name will continue on as St. Augustine Social magazine, but the personality of Old City Life magazine won’t be lost. 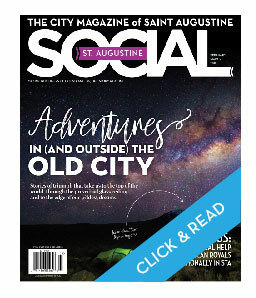 The fruits of the acquisition can be seen in the current Feb/Mar 2019 issue of St. Augustine Social that debuts a newly-redesigned look, larger fonts, and recognizable Old City Life traits like full-length feature stories, shopping guides, outdoor enthusiast features, and behind-the-scenes stories from restaurateurs. The Old City Life brand may not dissolve entirely. Once they have successfully carried out the merger plan of the two magazines, the Occasions Media Group team will continue to brainstorm a possible relaunch of Old City Life as a specialty publication targeted to a specialty demographic later in 2019. Residents can continue to support both magazines by subscribing at www.staugustinesocial.com/subscribe.